You’ll remember that last year I gave a blow-by-blow account of the Alessi Seminar. I honestly did not have the stamina for a repeat performance in this blog. 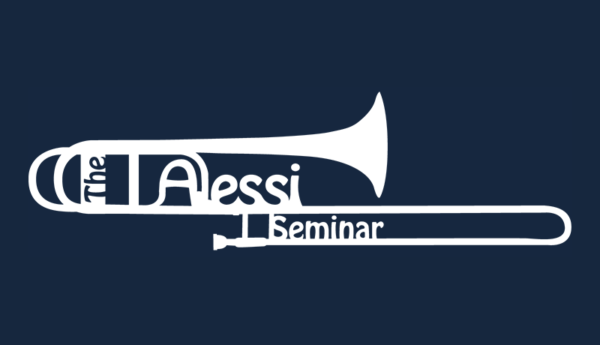 Attend the next Alessi Seminar and you’ll understand why! I don’t think you could find a more beautiful backdrop for the 2006 Alessi Seminar. Fassano, Italy, is a small town that sits on top of a large hill in northern Italy, near the wine country. As trombonists (and their significant others) from around the world arrived in Torino and Milan, they were greeted with spectacular weather. The “wives club” joined forces on a tour of the coffee/gelataria’s of Italy while players received top-notch instruction from Joe at the Seminar. The teaching was — as always — spot on, which caused players to reach new levels of performance. Performances were held each night in a castle courtyard. On one particular evening, a local band performed a concert (Joe joined in for a few numbers). People from the town came out to support the music. These Seminars are extremely intense. What they’ve shown me over the years is that we can all ratchet up the intensity in the practice room. We may think we are focused in our daily routines and practice, but the Alessi Seminar proves that there is always the next level. If Seminar participants and auditors take this one central idea away from the Seminar, I believe their performance and musicianship will reach that next level. The 2007 Seminar returns to Albuquerque, New Mexico. If you’re interested in a life-changing experience, go to www.slidearea.com so you can prepare your audition tape. Those planning to audit should also get their applications in as spots are limited. Joe Alessi is a special performer and teacher. Invest the time and expense to take the plunge into something you will never regret.